A default sales tax rate can be applied to all applicable transactions (Sale, Authorization, Refund) by entering a default sales tax rate in Mobile Settings (read more about this here). In the Optional Settings section, make sure the On radio button next to Sales Tax Option is filled in. 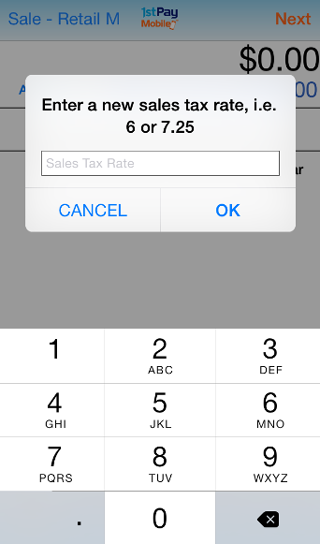 In the Enter Default Sales Tax Rate textbox, enter the percentage you'd like to charge for tax. For example, if you'd like to charge 6% tax, enter 6 in the box. If sales tax is enabled with a default tax rate, the tax line will display on the Amount screen after the transaction amount is partially entered. The tax line will show the default sales tax rate and transaction total including sales tax. 1stPayMobile will send the total amount of the transaction including tax to the processor for authorization. Sales tax can be easily adjusted in the mobile app to a different percentage as needed. Please Note: If no default sales tax rate is set, the sales tax line will not display on the Amount screen. You may apply custom tax within the App. You will see the default tax rate below the order total. Tap 'Adjust Tax' to the left of the default tax amount. Enter the desired tax rate. Tap 'Next' and continue the transaction with the Adjusted tax rate.